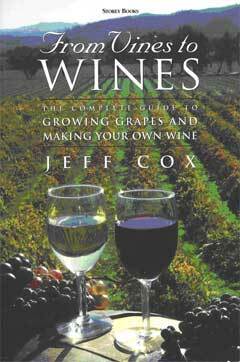 Jeff Cox has written 17 books, hosted two television series, done many radio shows, and lectured around the country on food, wine, and gardening—organic style. At this website, you can order any of the following. 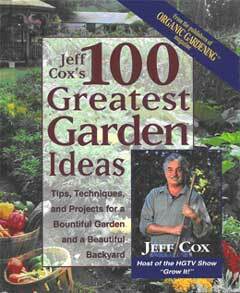 Jeff Cox’s 100 Greatest Garden Ideas—Jeff was an editor of Organic Gardening magazine for a decade and has been a gardener himself for over three decades. He learned tons of useful ideas from many people in those years, and here presents them as easy-to-apply methods for achieving real gardening success. Hard cover. 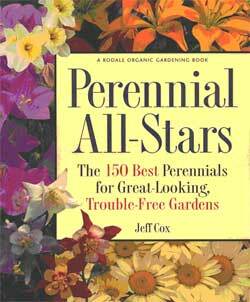 Perennial All-Stars—Over 100,000 copies sold. Lists the 150 all-time finest perennials for the garden. Identifies them by genus, species, and variety name. These are the flowering perennials with the longest season of bloom, the finest fragrances, the prettiest flowers, the greatest disease resistance, and that sail through wet conditions, drought, and poor soils. They truly are the perennial world’s all-stars. Soft cover. 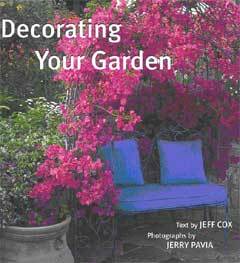 Decorating Your Garden—Everything in the garden but the plants. How to use hardscaping, fountains, benches, walkways, gates, arbors, and other practical and decorative touches to make the garden hospitable for humans and birds. Hard cover. 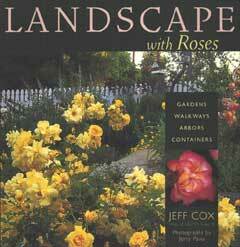 Landscape With Roses—From Taunton Press, the folks who bring you Fine Gardening, comes Jeff’s book on roses—how to know and use the various kinds of roses; which ones are disease resistant and require little care; when and how to prune them; growing roses in pots, as standards, as part of a mixed border, and much, much more. Soft cover. 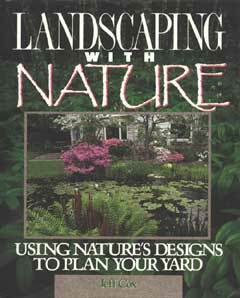 Landscaping With Nature—Over 250,000 copies sold. When designing a garden for your property, let nature inspire you with her beautiful plants, vistas, and arrangements of rocks, water, trees, shrubs, and grasses. So insightful, it’s used in college classes on landscape architecture. Hard cover. 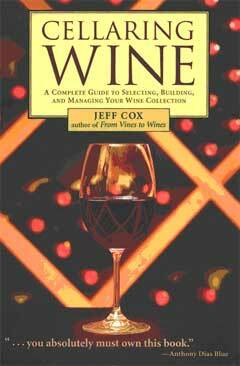 Cellaring Wine—Wine is one of life’s great pleasures, and properly aging wine increases the pleasure many times over. Here’s everything you need to know to build your own wine cellar or have one installed—including how long to age which wines. Anthony Dias Blue says, “You must read this book.” Soft cover. Creating a Garden for the Senses—How to design a garden that appeals to all six senses. That’s right, including the sixth sense. The book gives plant selections with textures to touch, fragrances to smell, flavors to enjoy, and colors and compositions to see. This book was translated into French and sold in widely in Europe. Hard cover. From Vines to Wines—Over 100,000 copies sold. The standard work on the subject of choosing a wine grape variety that’s right for your climate, growing the grapes, harvesting, making the wine, and bottling it. 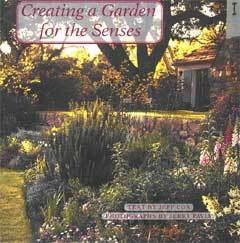 Includes full illustrations of pruning and trellising techniques. Soft cover. 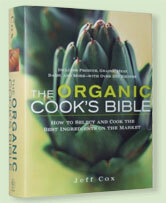 The Organic Cook’s Bible, a 540-page compendium written by Jeff Cox on organic vegetables, fruits, seeds, nuts, herbs, meats, cheeses, milk, eggs, wine, cooking oils and edible oils, fats, and more. Names the best-tasting varieties of each. Describes how they’re grown organically and why that should matter to you. Over 200 recipes and 200 color photos. Published by John Wiley & Sons, New York.